The free-flowing Salween is the last big undammed river in Southeast Asia, home to a flurry of endangered species including tigers and clouded leopards, writes Tom Fawthrop in Hpa-an, Karen State, Myanmar. And thanks to support from both the indigenous Karen people, and senior officials in China who see the huge ecotourism potential of the river and its dramatic gorge, it could just stay that way. China has covered almost all of its rivers with dams. But the Nu River (upper Salween) is the grand exception, where aggressive hydropower companies were forced into a rare retreat. In a world of galloping hydro-power rapidly engulfing the developing world and new dams popping up in the Amazon, the Congo and along the Mekong, it is hard to find any important river left in the world, that has escaped unscathed and undammed. The free-flowing Salween is the last important undammed river in East Asia, where endangered species including tigers and clouded leopards can still be found in remote parts of Myanmar’s ethnic Karen State. From the snow-capped mountains of Tibet, the Salween rushes through steep gorges in Yunnan Province and flows through four of Myanmar’s ethnic states before emptying into the Andaman Sea. Thirteen years ago strong protests led by Dr Yu Xiaogang’s Green Watershed – a Chinese NGO – and a geological study of seismic danger in this earthquake-prone zone, persuaded the former Chinese premier Wen Jiabao to suspend all dam projects. Anti-dam ethnic groups have been waging a similar campaign downstream in Myanmar, buoyed by the 2015 landslide election victory of the NLD (National League for Democracy) led by the peace laureate Aung San Suu Kyi, that turned the tide on more than 50 years of military rule. 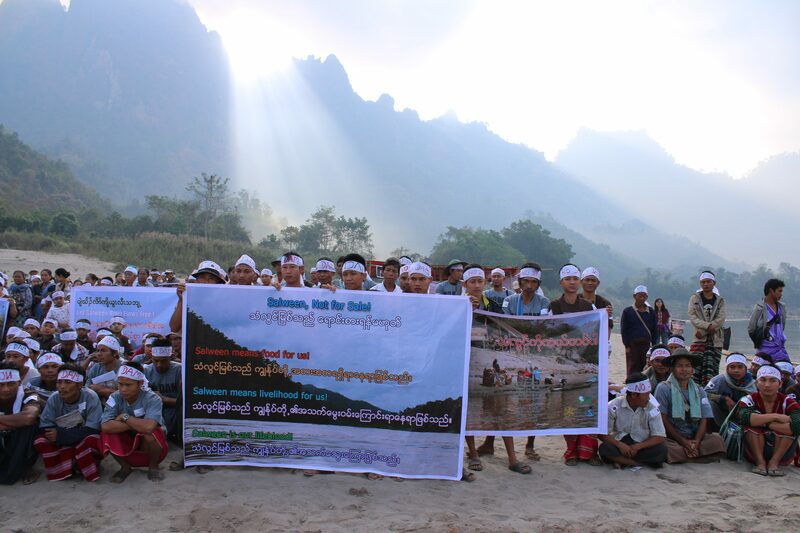 Each year on 14th March The Karen and Shan mark International Rivers Day a global event to express support for free-flowing rivers, and their opposition to dams (see photos, above right). The ethnic peoples of the Salween are determined to resist all attempts to go ahead with the six dams approved by previous Thein Sein government in 2013 on the grounds that such megaprojects will inundate villages, temples and ancestral lands. They will also destroy livelihoods and decimate fisheries. In Shan state Three Gorges leads a Chinese consortium for build a 7000 mw mega-dam -The Mongton Dam -that if it goes ahead, would be the biggest dam in the region. Further downstream in Karen State Chinese dam conglomerate Sinohydro and Egat (Thailand Electricity), are partners in another huge project -the Hatgyi dam. These agreements made with Chinese hydropower companies and Egat (Thailand’s Electricity Commission) without any parliamentary debate or public consultation, lack credibility and could readily be challenged by the new government. All the dam-sites are located in contested areas and conflict zones. Myanmar has been plagued by decades of civil war since the military first grabbed power in the 1962, coup. Ethnic rebel armies have been defending their ancestral lands and rights to autonomy ever since from attempts by the military junta to brutally suppress them. In 2012 political and economic changes led to peace talks with ethnic parties and several fragile cease-fire agreements. In an attempt to move the peace process forward with the newly-elected government, 300 local Karen leaders including representatives from three townships, in May 2016 decided to develop a ‘Salween Peace Park‘ based around their protected wildlife sanctuary. This remote area is protected by the ‘rebel forces’ KNU Karen National Union and their armed wing the KNLA (The Karen National Liberation Army) they have fought one of Asia’s longest-running civil war in defence of their ancestral lands. However ceasefires with Shan and Karen armed forces have been undermined by Burmese army offensives sometimes linked to the deployment of troops to secure dam sites. Stopping the dams and the promotion of a peace is seen as closely connected and interdependent. In our interview with KNU vice-president it is clear that as megaprojects are seen as triggers of conflict. So a strong message is being sent from the proud Karen people to Naypidaw the capital of Myanmar, to suspend all dams and focus on environmental conservation as the best avenue for securing a peace agreement and a political settlement to end the conflict. Could a ‘Salween Peace Park’ be an antidote to dams and conflict? The Karen claim the Peace Park / wildlife sanctuary can succeed, in the words of Saw Blaw Htoo, a biodiversity chief for Kesan, “if our way of life and environmental knowledge is recognised and supported.” Blaw Htoo is proud of leopards and tigers captured on his camera-traps (see photo). But while some high-ranking Burmese officials may query the qualifications and expertise of an ethnic group running an unofficial wildlife park, international conservationists are impressed with what the Karen people have already achieved. Environmentalists hope the Salween Peace Park will become part of the peace process.“It would be a big win for conservation if wildlife conservation protection is part of the larger peace agreement between the Government of Myanmar and the Karen”, says WWF’s Dr Mitchell. Which Chinese voices will the new Myanmar listen to? The Chinese suspension of dams on the Salween in 2004 is still in effect in 2016, despite efforts by dam companies to revive their projects. Yunnan Provincial officials have indicated they have adopted a No Dam policy, and a focus on “ecological civilization” that has been mentioned by Chinese President Xi Jinping as a new development goal. National Geographic magazine noted that Yunnan Provincial Secretary Li Jiheng and other officials expressed support for a national park to stimulate this region’s tourism which already attracts many visitors to the ‘Three Parallel Rivers’ World Heritage site. China has already decided the risks were too high to go ahead with the dams on the Nu River. All this puts pressure on the new Myanmar government to reciprocate and support this apparent policy shift from China. If Myanmar follows suit, then the dream of trans-boundary Chinese-Myanmar cooperation could become a win-win reality, which would keep the river undammed and at the same time promote eco-tourism, wildlife conservation and a nationwide peace settlement. Which Chinese voice will Myanmar listen to? Will the leaders of the new democratic government be swayed by the financial lobbying of Chinese dam-builders in Myanmar Sinohydro and Three Gorges corporations, eager to profit from Myanmar’s water resources and little concerned about environmental impacts? Or will Myanmar’s rulers listen to the voice of Chinese authorities in Yunnan who are now putting protection of their wonderful ecology along their Salween before the narrow commercial interests of hydropower companies? Tom Fawthrop has previously reported on dams, ecology, human rights, rebellions and military coups in the South East Asia for Al Jazeera TV, The Economist, the Guardian and The Ecologist. He is also a documentary filmmaker and has directed two films about dams on the Mekong and the Salween (Eureka films).